There’s been a noticeable uptick in quality spatial puzzle games in the past five years. Games like Stephen’s Sausage Roll, Snakebird, Jelly no Puzzle, and A Good Snowman Is Hard To Build all take the classic Sokoban formula of moving/changing objects to their designated zones/states and put in their own little wrinkles, exploring the possibility spaces created by these tweaks to the formula. I like to call them “SokoButs”, as in “Sokobon, but…” because it’s fun to create microgenres and nobody has claimed this one yet. Feel free to use it, because I sure will. I attribute this recent boom at least partially to the release of PuzzleScript, a free toolset for designing SokoButs, in 2013. PuzzleScript streamlines the game design process via a simple markup for defining the rules that govern a SokoBut’s core systems. 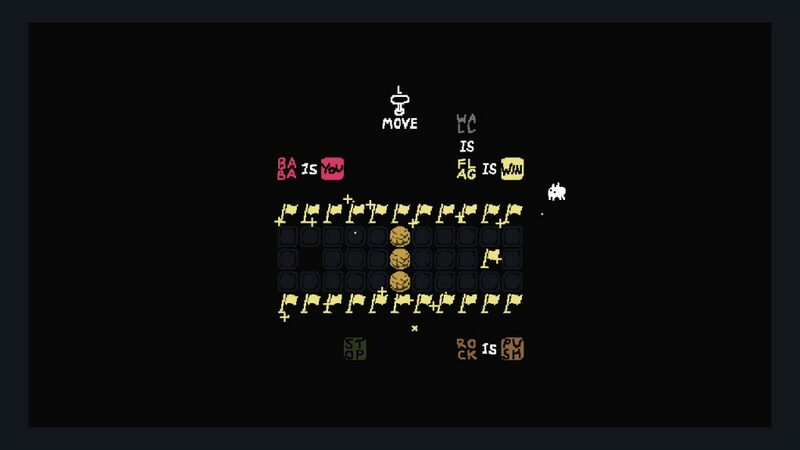 Baba Is You is a new SokoBut from Arvi Teikari, and its “but…” is huge: each puzzle’s rules are physical objects within the puzzle. By pushing around nouns, verbs, and adjectives, you rewrite the logic of the game in real time. Basically, it’s PuzzleScript: The Game. 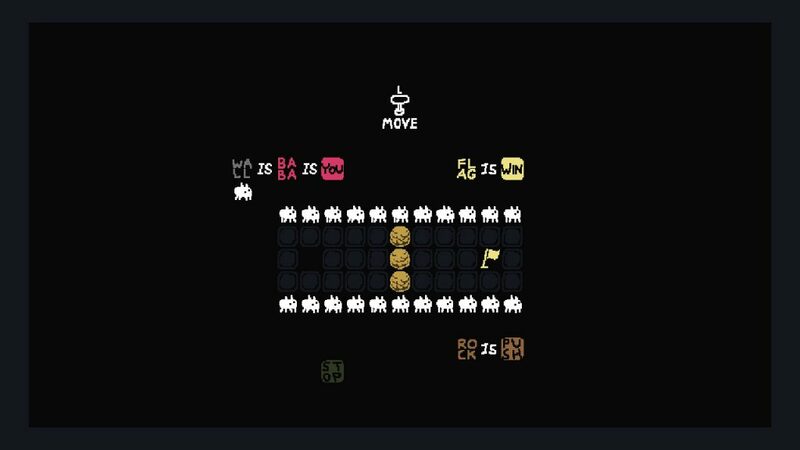 Baba Is You is an entirely new kind of logic puzzle, and it’s the best puzzle game I’ve played in a very long time. This is the level in its default state. The solution should be readily apparent if you’re familiar with this kind of game. Simply push through the rocks to reach the flag. And while the game will accept that solution, it’s not a very fun one, so let’s poke around a bit. First off, we could have simply walked around the wall. Hmm… Okay. We’ve become one with the wall. But what if we became the wall? Nope, no good. By the way, that prompt up top is the game’s way of telling you that you’ve lost control of yourself (in the game). It happens, but the rewind goes back all the way to the start of the level, so it’s not as bad as a game over in other games. Okay. Let’s try the other way around. Or we can just cut to the chase. Over there to the left. The possibility space this core rule-bending mechanic creates is staggering, and Baba Is You explores it thoroughly across over 200(!) levels. The world map is divided into areas filled with puzzles that explore a certain mechanic or idea, and those areas are further divided into subsections that follow themes within that space. As you progress through the game, it slowly increases the areas available to you at once. It prevents you from getting overwhelmed in the early stages, while later on it ensures you always have more puzzles to poke around in if you get really stuck on one. And that will almost surely happen, because this game gets very challenging even within the first couple worlds. 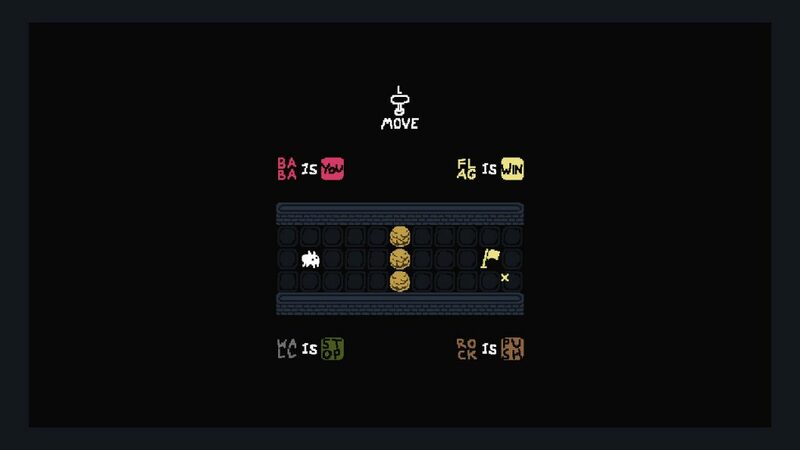 But this is a puzzle game that asks you to think about the game itself in a way I haven’t seen before, and I’m not about to fault Baba Is You for that. How often have you laughed at the solution to a SokoBut puzzle? Baba Is You had me laughing constantly, either in surprise at a plan actually working, or in a sort of “Oh you little stinker,” way after figuring out a particularly crafty puzzle. There’s a joy to Baba Is You that I haven’t really encountered in other SokoButs. Stephen’s Sausage Roll is a masterpiece of puzzle design, but I feel a more clinical appreciation of its elegant design while I’m playing. Snakebird fills me with some kind of puzzle solving aggression, getting amped about conquering whatever puzzle is next. Baba Is You had me continually excited just to see what was next, and somehow, I was never disappointed. I played the game on my Switch, and if you have the option, that’s the way to go. Being tethered to a desk or keyboard to play a puzzle game makes it feel too much like work for my taste, and the Switch’s combo of tablet form-factor and physical buttons is basically my puzzle-solving ideal. But I also found that playing on the big screen in my living room was fun in an entirely different way. Because I had a pre-release copy of the game, there obviously weren’t any guides or hints available for when I got hopelessly stuck on a few levels. Since I wasn’t about to beg the developer for a hint, I decided to pop my Switch into the dock and walk my roommate through my thought process. 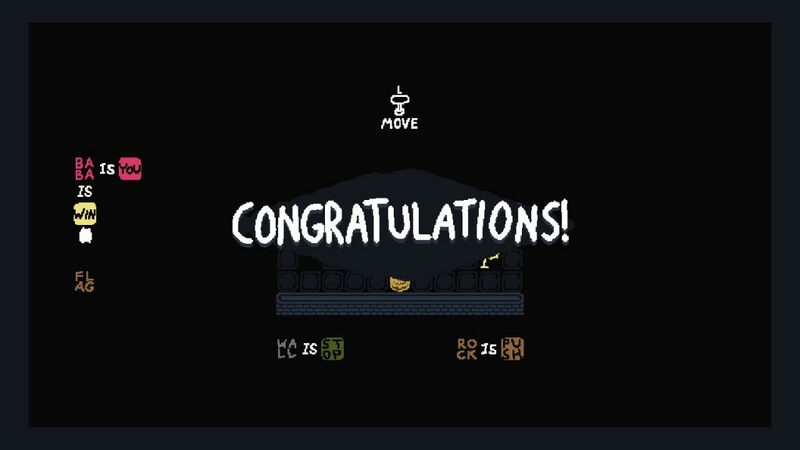 Going back and forth and theorycrafting our way through tough puzzles was just as satisfying as playing on my own, even if I didn’t personally input the solution. Maybe it’s because most of the recent SokoBut games haven’t come out on console, but I had never considered this mode of play before! It was a great way to spend a Sunday morning, and I could see this being especially fun with kids, if you’ve got ‘em. 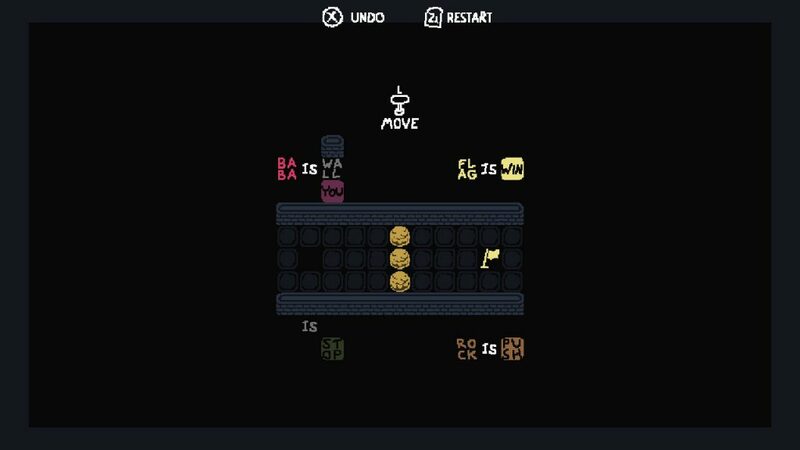 I really can’t recommend Baba Is You enough. If you are remotely interested in puzzle games, you should be installing it right now. I just bought it…looking forward to trying it out.